The constant call to innovate can infuriate even the most tech-savvy business owner out there. Not only do businesses have to maintain an online presence. They are expected to constantly monitor the market and correctly use those insights to amaze, delight and capture their future customers (who are already inundated with other businesses trying to do the same). As a business owner, how do you make sense of this? How do you balance the need to stay competitive now with the need to stay competitive in the future? The Three Box Solution highlights companies that, like GE, were able to use the principles from the above framework to pivot their product-based business to a leading service powerhouse for a new market. The book also highlights companies who failed to use to use the three boxes correctly, like IBM. IBM became hyper-focused on their strengths while failing to adapt to the “weak signals” (the changes that could drastically change the future). As a result, they declined, while a little company named Microsoft began making history. The Three Box Solution points to the principle of nonlinear innovation as the key to success in a rapidly growing world. Business, as presented in this book, does not exist in a predictable world. Business owners have to become comfortable with managing the uncertainty of the future while maintaining the core and avoiding the mental traps of the past. Vijay Govindarajan (www.3boxsolution.com) (@vgovindarajan) is an author and professor at Dartmouth College and a Harvard Business fellow. He began working at General Electric where he developed the concept of “reverse innovation.” One concept, $300 house, received an overwhelming amount of support and became a global initiative. The best part of the book is the breakdown of “Your business needs to innovate more” into realistic conceptual models. (This is in direct opposition to another book on innovation The Digital Transformation Playbook by David Rogers). This breakdown is accompanied by Govindarajan’s insight into the nature of innovation. He repeatedly points out the bigger principles (like his emphasis on rapid low-risk experimentation) rather than getting bogged down in unnecessary details. This is needed for business owners who want to know the “Why?” behind nonlinear innovation. The downside to The Three Box Solution is the overemphasis on the “three box” solution as the solution for innovation. First, the book is enamored with its own procedure. 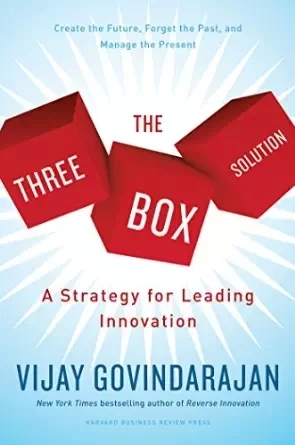 Right from the beginning, the book discusses the mystical connections of the “three-box solution” without really taking the time to explain what should be in the three boxes. The Three Box Solution is good for business owners who have read a little bit about innovation and need some kind of guide forward to action. While the book doesn’t detail how to start using the “three-box solution”, it does provide detailed examples of activities that would fit into each box and by extension into your business.